Gulet Charter Italy awaits you. Sail with us! A Yacht Charter Italy will make these vacations unforgettable...Sail with us! 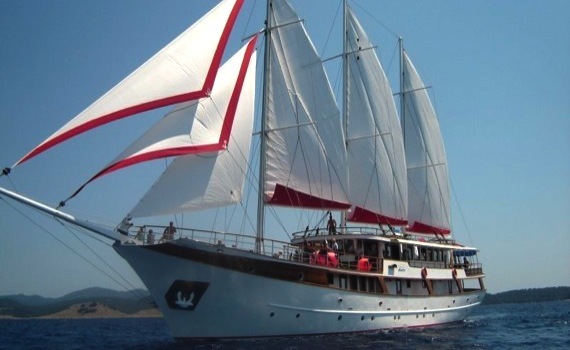 Why Charter a Gulet for Sailing Around Italy? 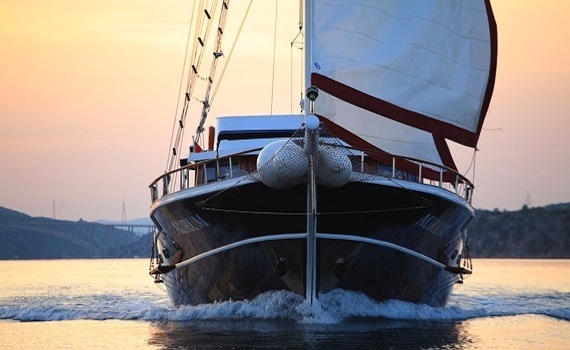 Gulet is a comfortable wooden yacht, using engine power and sails for navigation. High ceilings, wide corridors, comfortable cabins, spacious indoor salon with galley and bar and plenty of space in outdoor areas are enough to offer comfortable cruising around the Mediterranean, its most secluded bays and coves, wonderful azzure beaches and numerous islands and islets around Italy. Charter gulets usually have three to eight cabins, accomodating up to sixteen guests, making it a very popular charter for team building activities. 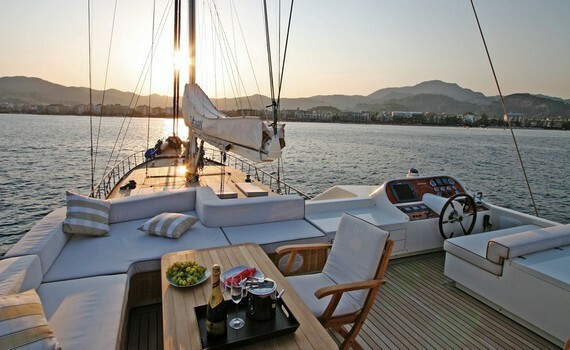 There are two charter gulet types - private and cabin charter. They have experienced and very professional crew who take care of your safety and provide you with comfort. Breakfast is the first meal on an Italian Gulet - simply coffee with bread, rolls, butter and jam. Lunch is traditionally with two courses - risotto, pasta, soup, gnocchi, polenta, crepes, casseroles or lasagnas and different meats and fish and usually dessert or fruit. A Sicilian-style brioche is a Mid-afternoon snack or merenda. Dinner is usually lighter, such as soup, broth, salad, cold meats, pasta, or lunchtime leftovers. Coffee is often drunk at the end of a meal - a strong espresso, often drunk very quickly in small cups at very high temperatures. The digestivo, also called ammazzacaffè if served after coffee, is the drink to conclude the meal - Grappa, Amaro or Limoncello. Luxurious gulet holding up to 10 people. Spacious, comfortable deck for romantic feel and cruise you will never forget. Wooden old-fashioned gulet for romantic cruising the Mediterranean Sea. 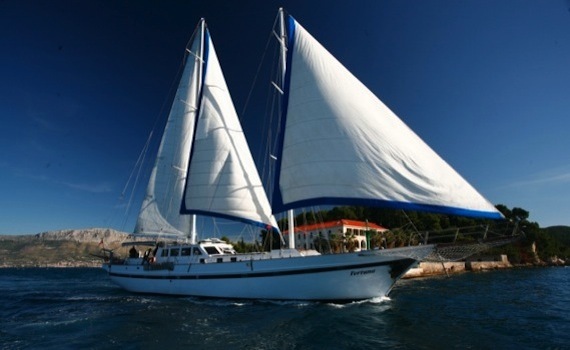 Deluxe gulet holding up to 10 passengers in 5 cabins. Comfortable and luxurious floating "hotel". Gulet cruises are one of the best options for a sailing vacation in Italy. If you would like to discover all the secrets of this traditional yacht, visit Gulet Cruise Selection, one of our specialized pages offering information on how to select the right gulet, what features you can find on a gulet and where you can charter your cruise. 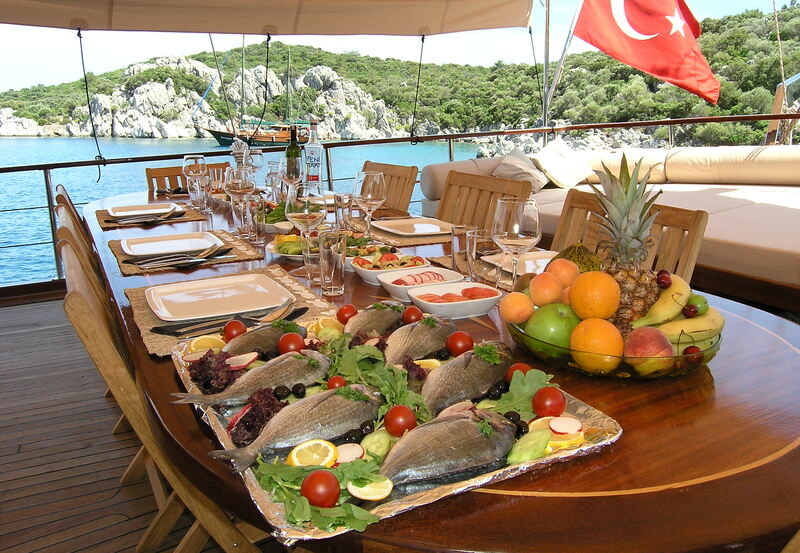 You can also find out what a typical day aboard a gulet looks like and what cuisine is served on your gulet cruise.